Windows Live Messenger (MSN Messenger) has the functionality to show the song you're listening to as your personal message so all your friends can see your music taste but unfortunately this feature is only compatible with Windows Media Player. 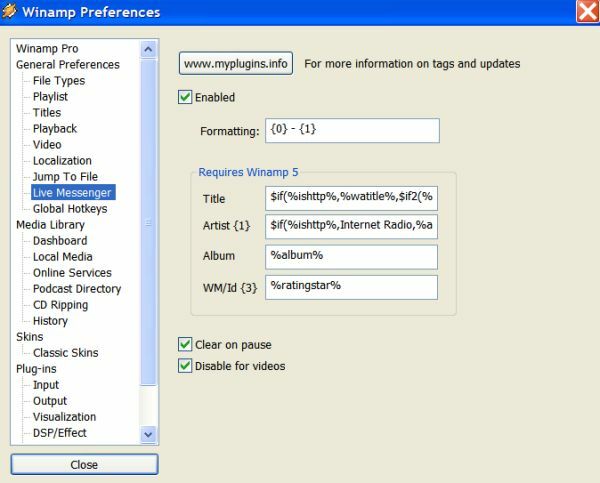 Not everyone likes WMP so here's a guide on making this feature compatible with Winamp. First make sure you have the latest version of Winamp. I can't guarantee this guide will work if you have an old version of Winamp installed. Also make sure you have a recent version of Windows Live Messenger. To make the "Now Playing" status message compatible with Winamp you'll need to install a plugin like the Windows Live Messenger Now Playing Plugin. You can download this plugin for free over here. Now open Windows Live Messenger and select "Options" from the "Tools" menu. Go to the "Personal" tab and make sure "Show song information from Windows Media Player as a personal message" has been activated. Now open Winamp and go to the "Winamp Preferences" menu. After you've installed the plugin you should see a "Live Messenger" section under "General Preferences". Check "Enabled" and close the menu. Now play a song :) Your status message should now change to the name of the song you're listening to. The plugin is also compatible with streaming internet radio.